An absolutely wonderful routine to perform with the birthday child! Complete with Tommy's own routine that he has performed for over 30 years. This page is for the gimmicked foulard and routine only. Most entertainers own a feather flower bouquet. 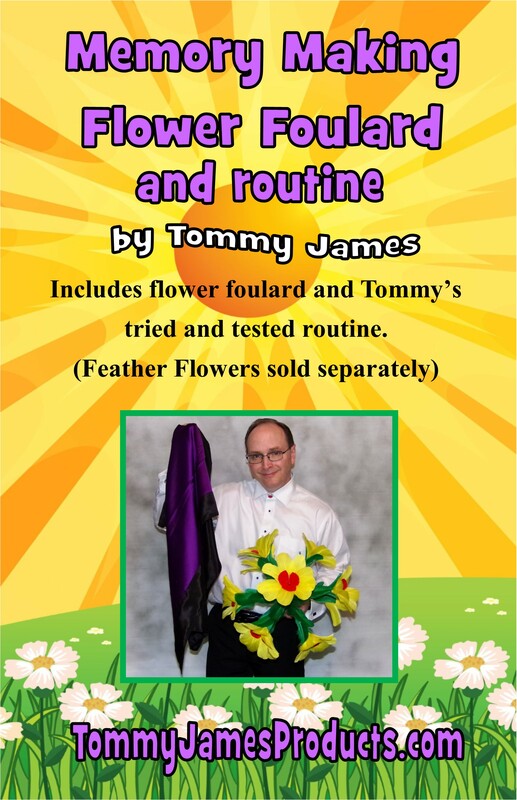 CLICK HERE for a gorgeous, ten-bloom feather flower bouquet made to Tommy's specifications to fit this Memory Making Flower Foulard. This has never been released on any video. This includes the special foulard made to Tommy's specifications along with his tried and tested comical routine. And get ready, because there WILL be someone with a camera wanting to get a snap shot of the child holding the flowers along with the magician! You will receive the special quality foulard made from satin and silk to Tommy's specifications, measuring 34" square along with his entertaining script that you may use or alter to suit your own performance. It will be a magical piece the birthday child will never forget.